Sony's PlayStation Vita in-a-set-top-box arrives in stores in North America tomorrow. 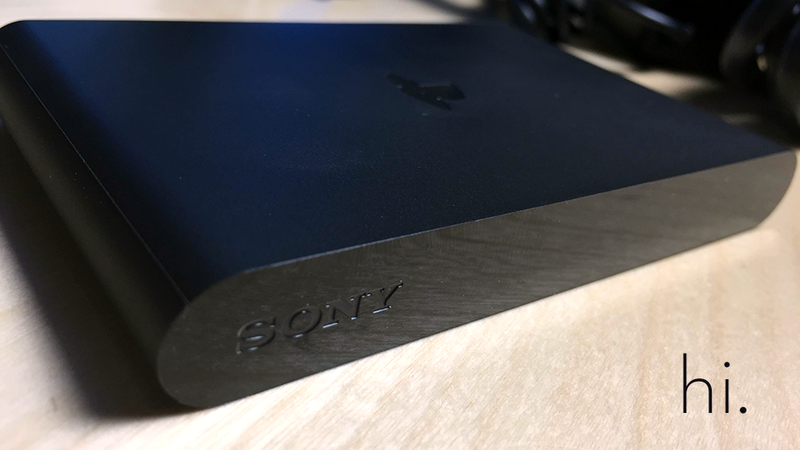 Here's what to expect while setting up the tiny PlayStation TV in your home. The PlayStation TV is a micro-console that attaches via HDMI cable to your television set or computer monitor. Inside the small black unit are the guts of a PlayStation Vita console, allowing users to play select games (those not extensively relying on the Vita's touch or camera functions) from Sony's handheld game system on their television set. Like the Vita handheld, the PlayStation TV also supports Remote Play for the PlayStation 4. That means PlayStation TV owners with a PlayStation 4 on the same home network can stream PS4 games from one room to another. The basic PlayStation TV package, retailing for $99, comes with the unit itself, a power cable and an HDMI cable. Choosing this package requires you already have access to a Dualshock 3 or Dualshock 4 controller, either of which can be used to control the system. You'll also want a memory card as well, as the PlayStation TV only comes with a single gig of internal storage. Sony also offers a $139.99 bundle, which includes the PlayStation TV, a Dualshock 3 controller, an 8GB memory card and a voucher to download The LEGO Movie Video Game. Hardware setup is relatively easy. Plug in the AC adapter, run an HDMI cable between the unit and your television, and be sure to have a USB cable handy to sync your controller of choice. The first slot is for your memory card. Then comes USB, HDMI, network and power. If you've got all of these ports filled, you'll be in good shape. Wireless networking is supported as well, but to get the most out of the system's streaming feature you'll want a wired connection if possible. Note that when fully connected and wired up, the PlayStation TV suffers from the same problem as other popular micro-consoles. The wires weigh more than the actual hardware. I had to fish my unit from behind the television stand twice now. I'm pondering gluing it down. On the side of the PlayStation TV is a PS Vita card slot, ready to accept your carded retail software. Sony has a page detailing which Vita games are compatible with the unit, so be sure to check it out before purchasing. Sony provided a copy of MLB 14: The Show for the Vita for review purposes. It loads just fine. Once you've got all of your cables connected, it's time to power this puppy up. I recorded a video of the setup process, editing out the bits where I entered my passwords. Apologies for the lack of sound. Note the video's max resolution is 720p — the same as the PlayStation TV's max resolution. Note — That's the max progressive scan resolution, the unit also supports 1080i resolution, but defaults to 720p because no one likes interlaced scanning anymore. The interface should be familiar to anyone who has played around with a PlayStation Vita, because really that's what the PlayStation TV is — a Vita without the screen, camera or microphone. Moments after I finished setting up the unit, the PlayStation Network went down for extended maintenance, so more in-depth testing will have to wait. I did manage to snag at least one downloadable game before I was locked out. Danganronpa 2, on a big screen. Yes, that will do nicely.